Even more things to know about the BA Amex 241! Even more things you need to know about the BA Amex 2-4-1 voucher! Yesterday I ran a long article entitled ‘Everything you need to know about the BA Amex 2-4-1 voucher’ which attracted a lot of feedback. Looking at the comments during the day, it was quite clear that it was NOT everything you needed to know! I updated the article during the day but if you read Head for Points by email or only saw the article in the morning then you would have missed the additions. Are there any easy ways of reducing the taxes payable? Start your trip in Jersey, because Jersey is outside the UK for APD purposes but inside the UK for 2-4-1 purposes. If you fly Jersey – Gatwick – Heathrow – XXXXX your taxes charge will be a lot lower. You cannot stopover in London for more than 24 hours or full APD is charged regardless. Start your trip in Inverness. There is no APD out of Inverness. There is also no APD out of Newquay but as BA does not fly there this does not help you. On a standard (non-241) Avios redemption, flying Newquay – Gatwick (Flybe) – XXXXX (BA) would avoid APD. What small print do I need to know? There are no circumstances under which you can ask BA to extend a 241 voucher. Don’t waste your time. You cannot use ‘part pay with Avios’ in conjunction with a 2-4-1 voucher. Your booking must be ‘100% Avios’. ‘Gold Upgrade For Two’ vouchers (issued when you earn 2,500 tier points) can be used in conjunction with a 2-4-1 voucher. Your flights will not be cancelled if you cancel your BA Amex card after making your 2-4-1 booking. You can fly a different class on the outbound to the return. However, both passengers must travel together in the same class. You cannot fly in First and book your companion in Club World if there is only 1 First reward seat available. Can I travel with an infant or book without my baby being born yet? Ye. For infant (under 2) bookings you pay 10% of the Avios and 10% of the taxes of an adult passenger. This can be booked online. If your child is not yet born, book for the two adults and then call to add the baby when it has arrived and has a name! These rules apply to standard Avios redemptions as well. If I cancel my BA Amex card after earning the voucher, is it lost? No. It is not clear if you would lose the voucher if you booked a redemption and then cancelled it – would the voucher be reissued if you no longer had a BA Amex? A recent HFP reader who did this found his voucher was returned. If I downgrade from the Premium Plus to the free card after earning my voucher, do I retain the 2-year expiry period? Can I change my class of travel if seats open up in a higher class after I’ve booked? Yes. Standard Avios change fees apply of £35 per person, plus of course the additional Avios. You need to call BA to do this because of the 2-4-1 voucher being involved. 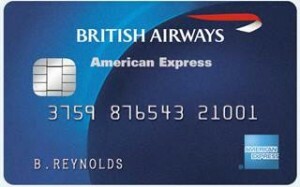 As I wrote yesterday, there are still two weeks left to apply for the British Airways American Express cards before the sign-up bonuses drop. If the idea of earning a companion voucher appeals, this is as good a time as any to apply. The bonus on the free card is increased from 3,000 Avios to 9,000 Avios points. £1,000 of spending within three months is required. The application form is here. The bonus on the Premium Plus is increased from 18,000 Avios to 25,000 Avios points. £3,000 of spending within three months is required. The application form is here. If you have any further questions about the voucher, please ask them in the comments. The Jersey/Inverness route is very interesting although somewhat inconvenient..
Is there any way of ‘skipping’ the initial Jersey/Inverness to London leg and joining the ‘connecting’ flight from London onwards and thus avoiding the APD? This would be a game changer! Zero chance whatsoever – everyone would be doing it if there was! Raffles any APD mileage in this? Passengers will now be able to jet across the pond from Cornwall Airport Newquay from just £229 each way. Aer Lingus has announced that from March 2017 passengers will be able to fly to North America and Canada (via Dublin) with fares including a checked-through bag, meals, in-flight entertainment and more. Destinations now bookable include New York, Boston, Hartford and Chicago, with Toronto on sale from January. When passengers fly from Cornwall Airport Newquay with Aer Lingus Regional they can also complete U.S. Immigration pre-clearance in Dublin before boarding connecting flights, saving time and hassle when arriving stateside. It comes in the same week that a Government report threw cold water over the possibility of comercial flights flying from Plymouth’s closed airport ever again. Al Titterington, managing director at Cornwall Airport Newquay, said: “Expanding our route network through cost effective, indirect routes further enhances the destination options available to those wishing to fly from Cornwall and the added bonus of the Immigration pre-clearance in Dublin will be of real benefit to passengers using this route to access North America. Anouncing the new flights, from Amy Smith, from Cornwall Airport Newquay, Jackie and Juan, from Aer Lingus Regional, and Richard Thomasson, of Cornwall Airport Newquay. Martin Saxton, chief commercial officer at Stobart Air (operator of Aer Lingus Regional), said: “We are pleased to be able to connect Cornwall based customers to Aer Lingus’s main line trans-Atlantic services via Dublin. Enjoy gourmet dinners, relaxing massages and walks through magical woodlands. Click to enter our prize draw now. sorry meant any APD & Avios redemption mileage in this? and it’s less in the wrong direction (if you’re going East) than buzzing out to ex-EU possibilities! I would also be interested in the outcome of this. NQY is 5 mins from my parents. I was completely unaware that there was no APD. Every day is a school day here on HFP! Shortly before Christmas I earned my first 2-4-1 voucher and was confused about the amount of time I had to book my reward flight. I rang BA and asked the following question. Do I have to take the reward flight by the voucher expiry date or do I have to book the flight by the voucher expiry date? BA said I have to book not fly by the expiry date, Having read your article I now doubt BA’s advice what is your view please? Sounds like you got a poorly informed agent! With the 241 voucher you always have to book AND fly the outbound leg before expiry. Thanks Alan. Loks like we will just have to take an extra holiday this year! It’s a hardship, but someone’s gotta do it! Alan, can you use the Lloyds upgrade voucher to book one way from say SIN or HKG back to London and can you use it online when availability appears at midnight? Hi Liz – yes, you’re not restricted to UK departures like the 241. I had to book over the phone ad I was doing an open jaw, but I think it can handle connections up to Edinburgh – perhaps try a dummy booking on Avios.com first to check? Interesting – it’s showing up fine on Avios.com, just searched for HKG-EDI and it’s showing connections via LHR. Haven’t got my next voucher yet though to try it with that – did you give it a go before calling them? I was going to try booking say SIN to LHR at midnight online then phone next day to add the EDI leg as that connection won’t be available till the next day. If I use 241 on the way out and Lloyds voucher on the way back I reckon I will save almost £200 each in taxes and only cost me an extra 3500 Avios and allow me to book at midnight – don’t have the voucher yet but not looking to book till may June time – just started looking at my various options – we are flexible on the say back but need to stop in SIN on the way out. Yes Alan I think I tried booking Lloyds voucher through website but it couldn’t process through to finish. I tend to use ME3 out to SIN then lloyds vouchers return to EDI, probably started the habit like you suggest to save on taxes. Ok thanks AH – I assumed the HK flights would all disappear quickly too – will keep an eye on them over the next few weeks – might end up doing another stop on the way home in Hong Kong. We could book Cathay from BNE to HKG on the way back. How did you get the booking through to EDI if it was the following day? I remember last year booking over the phone for the long haul leg and then phoning back the next day to add the domestic connection when it came available so should be able to do that again – and not get charged for the change as it wasn’t available to book. Hi there – I never knew that there was no APD flying out of Jersey / Inverness. I thought i’d try some combos flying from either of these cities to Tokyo or Hong Kong in business. Some messing around trying to get the search to work as I had to select yes to a stopover and select london, or the search would come up blank. The stopovers were 3-4 hours max each way but the taxes were still adding up to approx £1000. Am I doing something wrong here? Ohhh i see! Well that’s hardly the worth the effort of repositioning then 🙂 I guess going for first class is the best use for this redemption! Dunno, but 241 has to start in UK or Jersey so not Gibraltar although they did vote in the referendum for no apparent reason..
Are the on/off peak dates for 2018 likely to be released anytime soon? I’m planning on booking a 241 redemption for Feb 2018 but wanted to know if the dates I’ve got in mind will be on or off peak. You’re pretty much ok unless you’re a parent chained to the school holidays! There are two February half term weeks, one starts around the 12th, plus the following week. I don’t know if BA have cottoned on to both of them. I’ve been trying the dummy booking (with avios or cash) from INV to SJO yesterday and the system returned an error ” we don’t fly this route” even though it finds it just fine starting from Edinburgh or direct from London. Any ideas why is this happening? Have you tried doing a multicity booking to force the connection in LHR? It might be the timings aren’t easily working? Quote “If I cancel my BA Amex card after earning the voucher, is it lost? I was told by BA that under no circumstances should the card be cancelled as it would invalidate the voucher or be lost! I have just booked Club for August using a 241 earnt on the card and was told that it could be downgraded to the free blue one but must be kept ubtil the flight has beeb used!!?? Yup – as you’ll have seen from all the comments over the past few days that’s what Amex CS keep telling folk. It’s wrong but it’s up to you to decide how risk averse you are. I couldn’t ever see the booking itself being cancelled, the risk is only around what would happen to an unused voucher or if you cancelled the booking. Personally given experience to date I’d be pretty relaxed. This is at odds with this post here on FlyerTalk although it may just have been a GGL thing? I’ve searched for the answer to this to no avail. I want to fly return from LHR-BOM. The only availability on the outbound leg is in economy, and in first for the inbound. The interface on the BA website only lets me see either Econ – Business, OR Premium Econ – First. I therefore cannot seem to book this combination of flights. Can anyone advise how I can proceed? Probably have to ring them. Explain you can’t do it online and they will likely waive the fee. This is stupid functionality of the website and defies belief that this has got passed usability testing. The worst thing is that it’s been like this for years. Sure, it’s an outlier scenario and I’m sure customers travelling F one way and Y the other are a very, very tiny proportion of passengers, but they do exist. I’ve been trying to use a couple of 2-4-1’s for a while now to get to California but have been put off by the high taxes. So I thought Jersey/Inverness could be exactly what I’m looking for but I seem to have the opposite experience. For LAX or SAN, the taxes are actually a few pounds higher when departing from JER (without a stopover) than from LHR. And there’s no availability for any months I’ve looked at from INV. If I downgrade from the Premium Plus to the free card after earning my 241 voucher, then make a booking and subsequently cancel the booking, is the voucher returned? Definitely no problem if you hold the free card. Many Thanks Rob. I was just looking at how many comments these two BA articles had generated. There’s a distinct reader interest in avios and BA news. I Definitely think there’s scope for another blog to add to your portfolio, one that focuses specifically with BA and avios news/deals only? Anyway, keep up the great work. Nope, because they all interact. Interest in cheap Qatar deals is directly correlated to Avios tax levels. Hotel reviews are linked to destinations BA flies. Reviews of other airlines help you make clearer decisions about BA. Hotel promos may drive where you go with your Avios. It all loops in.